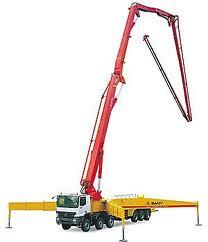 Concrete boom pump trucks are used for concrete pumping projects ranging from residential swimming pools, floors and foundations to large scale commercial concrete floors and walls. 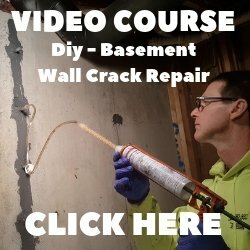 The time and labor saved by using a boom pump to place the concrete on these hard to reach projects make using them an easy choice. 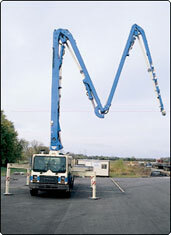 A concrete pump truck can range in size from single axle, suitable for confined areas where maneuvering is limited, to ten axle pump trucks used for large scale projects where long reach is needed. Convenience, time savings, and ease of pour are just a few words that describe using a pump truck with a long boom that can reach 100 feet or more. 1. Roll-and-fold boom pumps provide control and convenience on site. The versatility of their four-section booms combined with highly flexible boom tip articulation helps complete jobs faster and more efficiently. 2. Z-Booms are perfect for all boom pump applications, Z-Booms are especially suited for jobs where height restrictions are a concern. On crowded job sites and under low ceiling heights, Z-booms help you place concrete with ease. Putzmeister concrete pump trucks have roll-and-fold booms that range in size from 42 meter (124 feet horizontal reach) to 61 meter (184 feet horizontal reach) and Z-Booms that range in size from 20 meter (54 feet horizontal reach) to 70 meter (212 feet horizontal reach). 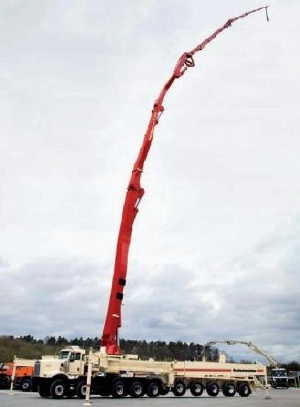 The largest truck-mounted boom pump on the market, the 70Z-Meter offers over 227 feet of vertical reach and nearly 213 feet of horizontal reach. This model features Putzmeister's exclusive Ergonic technology and a five-section Z-Fold boom design that allows maximum flexibility. 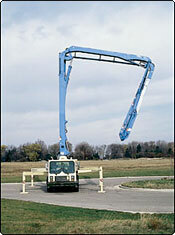 A boom pump usually stays in one place for the entire pour thanks to the long reach of the boom. This makes for fast, efficient concrete placements where, on most job-sites, the concrete is poured from one hose attached to the end of the boom, also called "dangle pumping". If you need a concrete boom pump truck for a concrete placement, there are many concrete pumping contractors you can hire to pump the concrete for you. Check with your local concrete supply store for business cards or search online. Most concrete pump operators charge a flat fee for the first 4 hours, then charge by the hour after 4 hours. 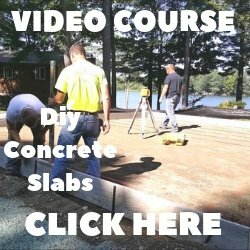 Here's some more great information about pumping concrete.